Steam carpet cleaning is the most efficient and effective way to achieve professional grade results on all types of carpets found throughout the house. It is a technical task performed by specially trained carpet cleaning technicians, equipped with the proper gear and materials. Steam carpet cleaning is usually applied to heavily soiled carpets which require a deep, thorough cleaning in order to bring them back to their former good looks. There are other types of carpet cleaning available as well, though this is the only heavy duty method recommended for the deep cleaning of carpets. Our technicians will use a steam cleaning method known as hot water extraction to yield the best results with no damage to the fiber and its structure. The hot water extraction method gets deep into the carpet and reaches even the most hard to get areas near the bottom of the carpet thus ensuring a thorough cleaning of all dirt and residue and killing of all bacteria which may be lurking in your carpet. Some people may be reluctant to use the steam carpet cleaning because of the longer drying time, but our cleaners will apply a special drying system at the end of the cleaning session and make your carpets dry and ready to walk on in a matter of hours. The steam cleaning method used to clean your carpets is user friendly and poses no health risk to the house occupants as it only uses the power of steam to get the job done. There are no nasty smells or residue, but only a clean, sanitized carpet which you can walk on almost immediately. In case the carpet is in worse shape than expected or it presents special cleaning requirements, our trained cleaners will approach the job carefully and apply the steam cleaning sparingly without furthering the damage should the carpet display such. Customers can be sure the carpets will not sustain any discoloration, damage to fiber, properties or shape. 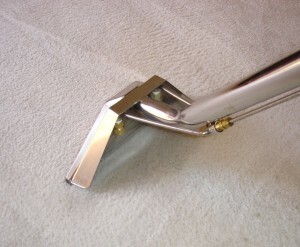 The steam carpet cleaning service is available seven days a week with flexible appointment hours for your convenience. Professional steam cleaning of carpets is the best and most effective way to keep any type of carpet looking better for longer without risk of damage to fibers or altering the carpet’s characteristics and appearance. Conventional carpet cleaning is hardly the best way to keep carpets clean as it attracts lots of additional costs and doesn’t necessarily yield the best results. Another reason to have the carpets cleaned professionally is the accumulation of dust-mites and other household bacteria which works its way deep into the carpet’s base and can only be removed by steam cleaning. It is strongly recommended to perform professional steam cleaning of carpets at least twice a year in order to keep them fresh looking and efficiently sanitized for longer. The steam cleaning is also used for heavily soiled carpets which do not respond to other conventional treatments, steam cleaning is also the most sparing and unaggressive method to look after natural and manmade fibers as it only uses the natural cleaning power of steam i.e. water. Carpet steam cleaning is a technical task which is performed by our specially trained cleaning technicians. We train our cleaners to be efficient and to display sound technical knowledge in order to deliver exceptional cleaning results every time. The cleaners will use modern equipment which causes no damage to the carpet’s fibers or any other objects or fabrics in the area. The method we generally use on all jobs is known as hot water extraction and is designed to lift and remove even the most stubborn stains without damaging or altering fibers and their characteristics. Your carpets will be ready to use and walk on in a matter of hours after the appointment is done as our technicians will apply a special quick-dry system so you can enjoy your freshly cleaned carpets sooner. As they will only use the power of hot steam to clean the carpet, there will be no nasty smells or chemical residue left on any surface or the carpet itself. The steam cleaning poses no health risk to house occupants or pets. Carpet hygiene around the house is quite important, even if you don’t see the dirt and dust on your carpet it is there, it is slowly building up, and making its way further down inside your carpets with each step you take. Dirt and dust may not seem like the biggest of problems but think about all the bacteria lurking inside the carpet as well. Isn’t it time you did something about it? If so, all you have to do is call us and let us handle your carpet cleaning in one single setting. Steam carpet cleaning is the only proven way to clean deep inside the carpet and eradicate all the germs and bacteria there. Steam carpet cleaning is especially important for heavy traffic areas such as around the front door and the hallway. It is recommended you subject your carpets to professional cleaning at least twice a year for best results and optimal hygiene. Our specially trained crews can perform exceptional steam cleaning of all types of carpets both natural fiber and synthetic. We understand that carpeting throughout the house is a costly investment and keeping its good looks for longer is quite important, customers can be sure our cleaning crews will do a top level job without causing any damage to the carpet or its characteristics. We will use the natural cleaning power of hot water or steam to yield great results with no risk of damage. The cleaners will use a method known as hot water extraction to lift off and remove even the most stubborn of stains. If you have specific staining on your carpet, we advise you to avoid homemade treatments as these will only further the damage and drive the stain deeper into the carpet. Use our steam cleaning service and save yourself hundreds in carpet replacement and damages. The hot water extraction method works deep inside the carpet, all the way to the base, ensuring total hygiene and killing of all bacteria. This method also dries the carpet so customers can enjoy their freshly cleaned carpets in a matter of hours.